The tree may look like an ordinary tree, but it can kill if you are in the vicinity. Standing underneath the tree during the rains can scald you by the raindrops running off of the leaves because it contains a strong toxin. The Manchineel tree is native to the Caribbean, Florida, Bahamas, Mexico and Central and South America. The tree can be found on coastal beaches and in brackish swamps where it grows among mangroves. It provides excellent natural windbreaks and its roots stabilize the sand, thus helping to prevent beach erosion. 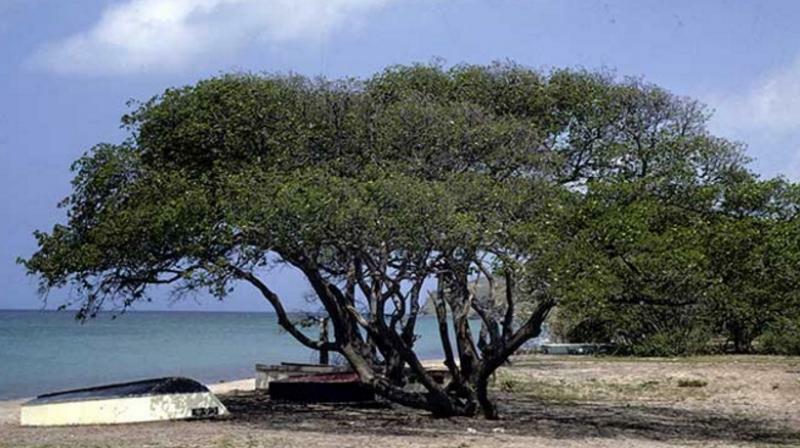 The Manchineel tree looks harmless, but it is the most dangerous tree in the world. Its fruit is nick named as ‘little apple of death’. Also known as the beach apple, Manchineel is a tree that has a superficial resemblance of its fruit and leaves to those of an apple tree. All parts of the tree contain strong toxins, some unidentified. The tree has a milky sap that contains phorbol and other skin irritants. If you happen to get it on your skin, it causes immense allergic reactions or dermatitis. Standing below the tree during the rain will cause skin blisters. The sap is highly acidic and has been known to damage paint on cars. Burning the tree causes ocular injuries if the smoke reaches the eyes. The fruit if eaten is also fatal and ingestion produces sever gastroenteritis with bleeding, shock, bacterial superinfection and airway compromise. Carib Indians used this tree’s sap to poison their arrows and would even tie captives to the trunk of the tree to ensure slow and painful death. Check out the video below that will give you some more insiders of the Manchineel tree that also has an entry in the Guinness Book of World Records.